For $10 you can now ski at Crested Butte Mountain Resort. Oh, but forget about the chairlifts. A new policy allows skin-equipped skiers to kick and pole uphill on designated routes. 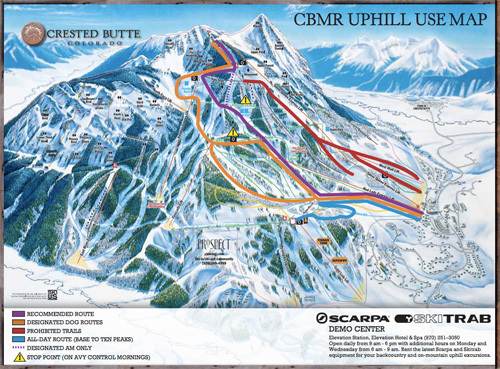 Uphill skiing trail map for Crested Butte Resort, Colo.
More than 100 people a day already do it at Crested Butte. The new policy, initiated last month, was put in place “due to the ever-growing popularity and a desire to grow and embrace ‘fitness skiing,’” the press release states. A new ski-touring facility, the Scarpa/Ski Trab Demo Center, offers gear for skiers looking to try uphill at Crested Butte. You can rent touring skis, boots and skins. 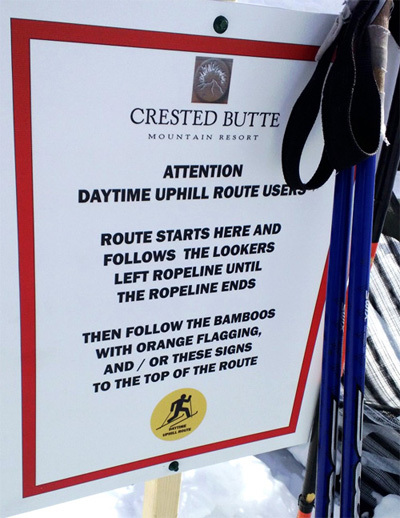 Crested Butte offers uphill skiing lessons. With its new policy and gear rental options, the resort hopes to enhance the experience for current uphillers while encouraging new skiers looking to learn the ropes before heading into the backcountry. Fitness-minded skiers who head uphill for a workout are a big part of the push, too. Dogs are allowed before and after lift operating hours. 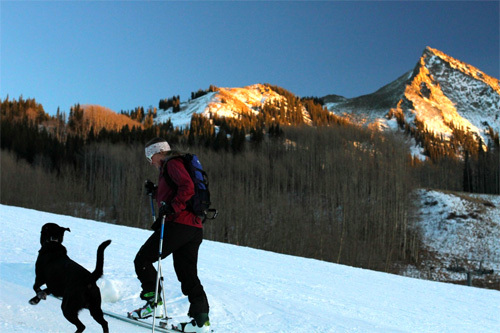 You can ski uphill during the day without a four-legged friend. Aspen, Breckenridge, Arapahoe Basin, Steamboat, and other Colorado resorts have uphill-skiing policies in place. 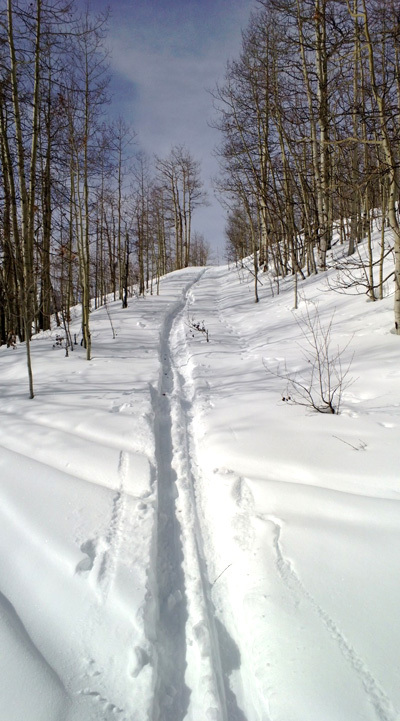 All over the country, ski touring and backcountry skiing participation is on the rise. There can be a “bridge formed between safer backcountry travel and uphill pass programs,” noted Kristin Carpenter-Ogden, founder of Verde PR & Consulting, based in Durango, Colo. Verde recently organized a well-attended panel discussion at the SIA show in Denver where resort uphill was among the topics. Miller added that beyond backcountry connections more skiers now enjoy going uphill for exercise and fun. “The ‘hiking’ facet of the sport is quickly gaining in popularity,” he said. We see uphill resort skiing as a stepping stone for people looking to learn to ski tour. It can be a great workout. Bring your dog, too, if the resort allows. He already knows the utter joy of blasting uphill, miles at a time, through deep and fluffy white above and beyond.